Do your little ones enjoy being outside, exploring & creating in nature? Would you like your children to enjoy an alternative playgroup where they learn in and about the great outdoors? 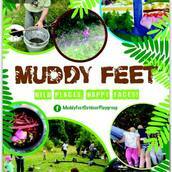 We aim to let children explore with the emphasis on child-led play, letting them get their hands dirty...Muddy Feet are compulsory! Mud kitchens, bug hunting, hammocks, camp fires, den building, natural art, outdoor cookery, scavenger hunts. Half Termly sessions, must be pre-booked. Parties also available.